Tales from the 'The Gathering'. Steel Horses, Iron Will is a brand new comic stip dedicated to travelers on the road of life and motorcyclists in particular. It is intended for mature audiences and could contain material some might find objectionable provided they are absolutely determined to. There is an oasis on the road of life, a shelter from the storms, a sanctuary. A place where the normal rules don't really apply. That place is here, and if you truly need us, you will find us waiting. Come in, look around. Welcome to The Gathering. November 26, 2005--Well, I owe you guys some news. The webcomic world is fraught with strips that don't update. That's just the way it is at times, people have busy lives and their passion...and their art...whether that be webcomics, writing, music or whatnot, is often pushed to the bottom of the list. I am appalled to find myself among the ones that aren't updating, and even there I am flattering myself. I've never gotten good and started to begin with. I thought/knew I could do better. Ack. Basically, I should have gotten started before I told anybody about the project, maybe with the character art fleshed out and a bunch of strips ahead. Note that this is strictly a translation issue...I have the characters and story, that is not where the difficulty lies. I do have a story to tell here, and simply found my skills and available time were not up to doing justice to my vision. (shrugs). So, off to work I went. I've been working on my characters, style, and tecnique, and there will be substantial changes to what you have seen here so far. Having said that, I suspect I'll never feel my skills are up to par, and much like in my writing, I may never be satisfied. So, it's getting time to just start posting stuff (that forces practice) and sit back and watch the charactes evolve as the skills do. I've also finished my third book Life Is a Road, Ride it Hard! and it is doing well. And just to continue the news thread...I've got a fourth and fifth book in the works...one is another in the Life Is a Road series, and the other an fiction novel expansion of the characters introduced in the short story Storm Rider. Check it out and comment if you'd like. 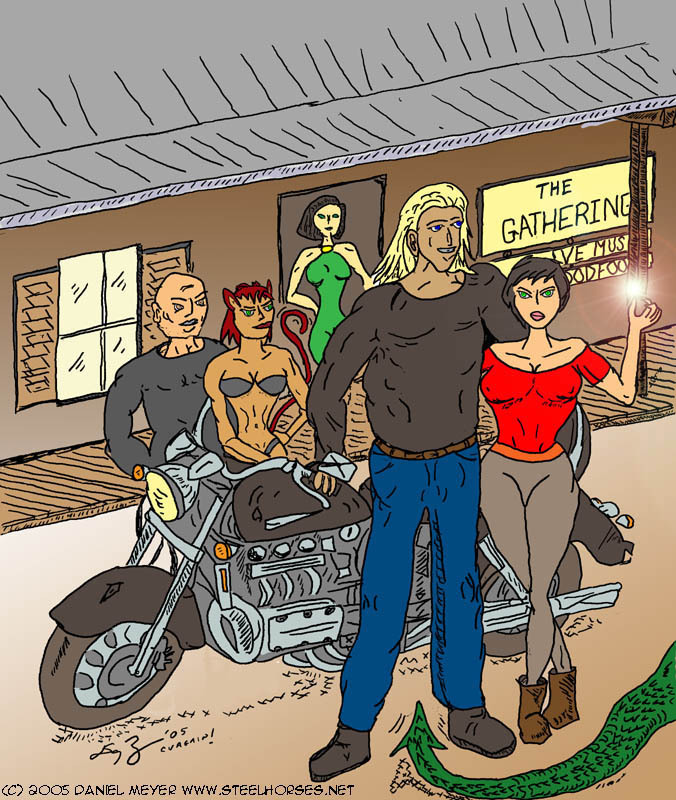 In addition to publishing Storm Rider as a full length fiction novel, it will also be a graphic novel eventually published on-line, and in some ways will be the precurser to some of the characters found in Steel Horses. Anyway, those that are watching...thanks for your patience and encouragement. I will be updating and adding character studies soon...but will not be publicizing the strip until I get the site going with it's own unique look AND have regular strip updates. As always, feel free to contact me with comments or suggestions! All content © Copyright 2009 Daniel Meyer. All rights reserved. Life is a Road, Steel Horses, Iron Will, and Stormrider are trademarks (TM) of Daniel Meyer. Last update: 11/16/2009; 8:27:20 AM.